"They said we'd be safe.. They said an offering would be enough... They said they wouldn't be hungry..."
The Vampire Nest is a printable battemap compatible with any RPG game. It can be used as a standalone gameboard, or combined with any same-scale tileset. The Vampire Nest is a day & night set, comprising 20x20 2 battlemaps. The map consists of a two caves reached by a narrow mountain path. The first cave is a dead-end, but features a sinister bloodstained altar. The second cave, reached only by braving a narrow ledge, consists of two areas. The first area is strewn with bones and dried blood, hinting at the danger of the cave. The inner cave is the nest of six vampires, their stone coffins lying untouched. The Vampire Nest is ideal for countless adventures. If you're planning a Halloween or Horror story, with Vamprires, murder and horror, the map is ideal. Perhaps a group of villagers have braved the climb into the hills to put an end to the Vampire menance once and for all, or perhaps a group of acolytes have gathered to offer a blood sacrifice to the undying of the cave. The pack includes an A4 pdf document with 300dpi gridded versions of each map. Also included is a set of gridded and gridless 300dpi full size jpgs, for poster printing or VTT. 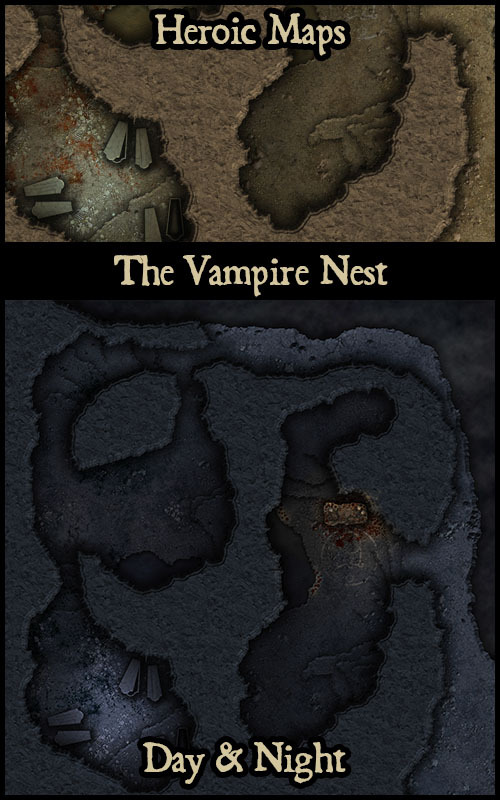 The Vampire Nest- 2 battlemaps, and can be printed at 28mm and 25mm scale.